Dawson, Bob. "Saint Mary’s Players Make Hockey History". The Canadian Encyclopedia, 30 January 2019, Historica Canada. 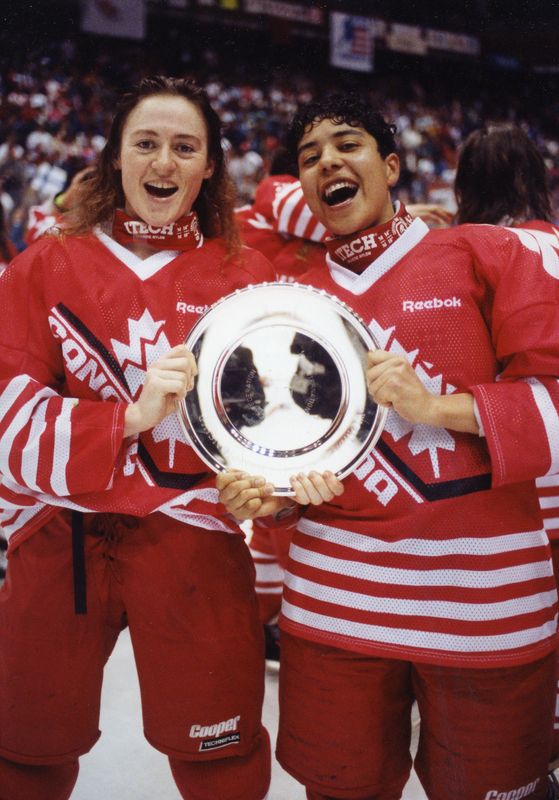 https://www.thecanadianencyclopedia.ca/en/article/saint-marys-players-make-hockey-history. Accessed 23 April 2019. 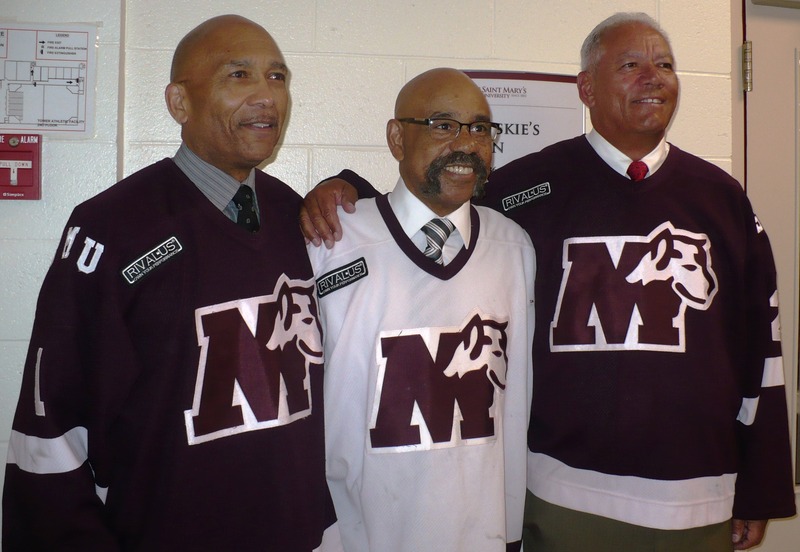 In 1970, Bob Dawson, Darrell Maxwell and Percy Paris made history at Nova Scotia’s Saint Mary’s University by becoming what is believed to be the first and only all-black forward line in the history of Canadian university hockey. Bob Dawson, Percy Paris and Darrell Maxwell (Photo Courtesy of Rick Fraughton). For several years prior to 1967, Saint Mary’s University in Halifax, Nova Scotia, did not have a hockey team. 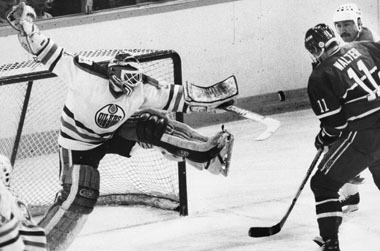 That year a decision was made by university officials to revive its hockey program. In need of a coach, Bob Hayes, athletic director at the time, contacted Sam Pollock, then general manager of the Montreal Canadiens. Pollock recommended Ottawa	native and former professional hockey player Bob Boucher for the position. Boucher was hired and immediately set about rebuilding the Saint Mary’s hockey program. In the fall of 1967, Coach Boucher held open tryouts for those players interested in playing on the Saint Mary’s Huskies. I was one of over 40 players who participated in the tryouts. Having impressed the coach with my toughness and mobility with the puck, I made the team as a defenceman, becoming the first black to play in the Atlantic Intercollegiate Hockey League (AIHL). The following season, in 1968, Coach Boucher considered me one of the most improved defensemen in the AIHL. Lowell MacDonald, a former NHL player with the Pittsburgh Penguins, and Saint Mary’s student, felt that I had the talent to play in the NHL, if given the opportunity. Unfortunately, between 1963 and 1973, no blacks were even drafted by NHL teams, let alone played in the league. It’s as if there was an unofficial policy of exclusion in the NHL. During the 1967–68 season, Saint Mary’s played a series of exhibition games against the Brookfield Elks, a Senior “A” hockey team. After watching Darrell Maxwell play with the Elks, Coach Boucher convinced Darrell, a native of Truro, Nova Scotia, to play for the Huskies in the 1968–69 season. Prior to 1967, Darrell played Junior “A” Hockey in the Québec Provincial League with Victoriaville and Shawinigan. He played right and left wing with Saint Mary’s from 1968 to 1972. A play-maker and scoring threat every time he stepped on the ice, Darrell was one of the team’s top scorers in each of his four years with the Huskies. Percy Paris was the third black to play for Saint Mary’s during this time. Prior to joining Darrell and me on the Huskies in 1970, the speedy forward from Windsor, Nova Scotia, played with the King’s College School in Windsor, which some consider the birthplace of hockey. While there, Percy was instrumental in helping the team win the Nova Scotia Headmaster’s Hockey League Championship in 1965–66 for the first time. He also played for a time with the Windsor Junior Royals before going to Saint Mary’s. Unfortunately, Percy’s promising hockey career at Saint Mary’s was cut short due to a serious car accident. In 1970, Darrell, Percy and I made Canadian university hockey history by playing on the same team together. Saint Mary’s became the first, and only, Canadian university to have three black players on its hockey team at the same time. To add to that distinction, Coach Boucher, during a game against Mount Allison University in Sackville, New Brunswick, put the three of us together on a “forward line.” In doing so, we became what is believed to be the first all-black forward line in the history of Canadian university hockey. We played together again in one or two other league games. As it happens, we share a bit of hockey history with Ossie and Herb Carnegie of Toronto, Ontario, and Manny McIntyre of Fredericton, New Brunswick. Known as the “Black Aces,” they played together on a line in the 1940s in the Québec Senior League, becoming the first all-black line in hockey outside the Coloured Hockey League of the Maritimes. Being at Saint Mary’s together during the 1970–71 season was a special time for us. Out of that relationship evolved a friendship and bond that increased over the years and still remains today. Looking back, Darrell, Percy and I have fond memories of our years playing hockey with Saint Mary’s. More importantly, we take great pride in the fact that as a group we helped the hockey team amass an impressive five-year record of 93 wins against only 13 losses and two ties; win consecutive Atlantic Intercollegiate Hockey League Championships from 1968 to 1972; and go on to represent the League at the Canadian Intercollegiate Hockey Championships from 1969 to 1972. The Huskies made it to the finals in three of the four years only to lose to the University of Toronto Varsity Blues in 1970, 1971 and 1972. After successful and distinguished careers in the Canadian federal public service, Darrell and I live in Ottawa	and still lead active lives. Darrell is involved in ministry work for his local church and short-term mission assignments abroad. He also does volunteer work in the community with seniors and other groups. I continue to play hockey and serve as a family advisor for aspiring black hockey players. Also, I’m a contributing sports writer for Box Score World Sportswire and work with community groups. As for Percy, he too is retired after seven years in Nova Scotia	provincial politics as an MLA representing Waverley-Fall River-Beaver Bank and serving in multiple Cabinet positions including Economic and Rural Development and Tourism, and African Nova Scotia Affairs. He lives in Windsor, Nova Scotia, and enjoys family life and travelling. On 18 February 2012, the Black Ice Hockey and Sports Hall of Fame Society in Dartmouth, Nova Scotia, recognized Darrell, Percy and me for our achievements in and contributions to hockey at the event Reclaiming Our Black Ice Hockey History. In hearing about Saint Mary’s all-black forward line, Rogers Sportsnet produced a short TV feature on us that aired nationally on 14 February 2015 during Scotiabank Hockey Day in Canada. On 4 June 2015, we were presented with a Pioneer Award from the Multi-Ethnic Sports Hall of Fame of Oakland, California, for our community work and achievements in hockey at a special community awards ceremony at Saint Mary’s University	in Halifax.